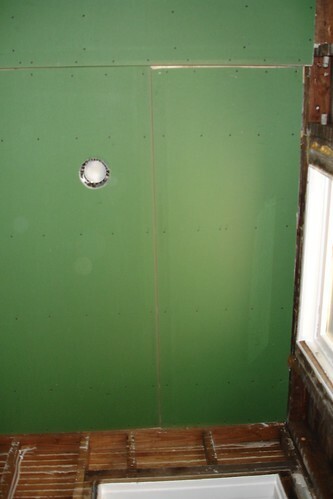 With all of the insulation in place, Friday marked the start of the drywall installation. We rented a drywall jack for $25 and set to putting the ceiling in place. Since the we lowered the ceiling height in the shower area by 6 inches (to 8 feet even), we decided to start there, since it’s just one piece. Getting it cut to size was easy enough, and with the clever trick of rubbing chalk on the bottom of the light fixture, we raised the sheet into place and got a nice outline of where to cut for the fixture. 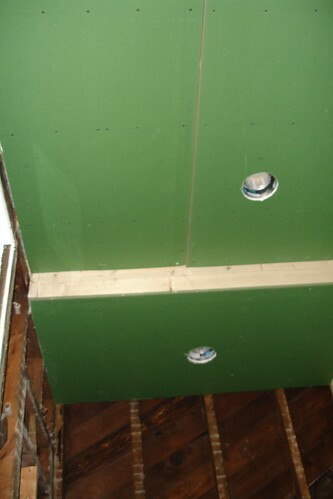 The next piece, in the main ceiling area, had four (4) holes to cut, and it was much trickier to get them all right. We still have to enlarge the hole we cut for the exhaust fan, but at least it’s not completely lost behind drywall.